Best CSS Frameworks - Bootstrap vs Foundation vs Skeleton? 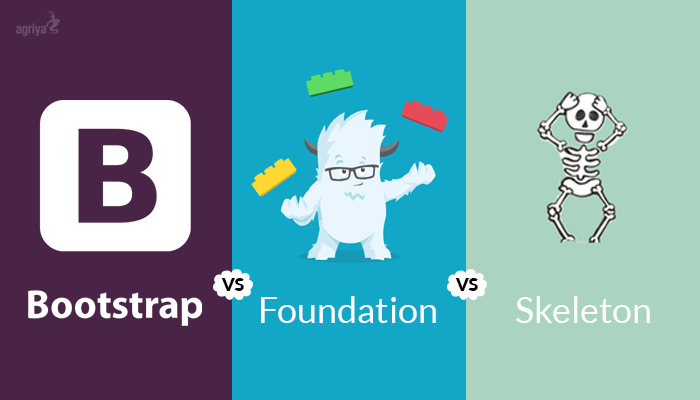 Home best css frameworks bootstrap vs foundation vs skeleton Bootstrap Web Development custom website development Best CSS Frameworks - Bootstrap vs Foundation vs Skeleton? Responsive frameworks are gaining utmost importance along with the bells and whistles created by the introduction of different kinds of smart phone devices in the open market having multiple screen resolutions. For developing websites and applications, a custom Bootstrap web development company selects frameworks as per their preferences. Still, among the responsive frameworks Skeleton, Foundation, and Bootstrap are widely utilized by developers for building applications as well as websites encompassing great interface, and good performance. Frameworks can be divided into two categories in general: a front-end framework, and a back-end framework. Both these main categories have sub-divisions, as well. Anyhow, an exceptional framework should be backed with attributes such as easy grid system, neat codes, excellent as well as modifiable templates, clarity in the naming, and superior performance. Without much arguments, we can simply come to a justification that Bootstrap, Foundation, and Skeleton are mostly used frameworks for developing responsive web designs of various specifications. Each of these frameworks has certain strong features subsequent to the weak points, a developer must be aware of both sides to make a better choice between these three widely used frameworks. Skeleton, as advertised in its official website is “dead simple”, especially in offering a responsive boilerplate. The main types and web layouts it offers are good enough. But it is not rich in CSS, and has limited number of templates to provide for designers purpose. Even though the designs are clean, developers will have to spend a lot of time in development. In addition to all these it offers only single demo at a time, causing much inconvenience for many developers. Foundation is just an awesome framework in comparison with Skeleton. At the time of downloading, Foundation offers four choices, namely complete, essential, custom, and Sass and make sure that developers get suitable codes for meeting the demands of their projects. It has plenty of ready made codes, and comes with multiple types of fantastic resources and templates. Foundation is backed by a robust and simple grid system accompanied with clear naming, as well. For beginners it proves to be a better platform. Development of web projects using Foundation is faster, and can be done is less time when compared to Skeleton. In terms of designing, Foundation normally holds a ‘mobile-first’ approach. To most developers, Bootstrap is the best responsive framework, for it treats all devices equally. The codes are super simple, neat, and a step-ahead in terms of refinement, in comparison to foundation. The availability of wide varieties of templates that can be customized, is the one domain in which Bootstrap really outshines all other frameworks. Some developers argue that it offers the same kinds of designs and templates, but it has exclusive varieties of templates that are ready made for development. Another aspect in which Bootstrap stands tall is rapid development. It is faster than Foundation, and many other frameworks available in the market. Hence it happens to be the first choice for all professional web developers when it comes to custom website development. Skeleton is inferior to Foundation and Bootstrap in many aspects. It consumes more time when dealing with big projects. But for small projects that demand fewer codes, Skeleton proves to be an ideal choice. The real tug of war is between Foundation and Bootstrap in which both stand neck to neck in many aspects. Still, Bootstrap holds a slight advantage in terms of speedy custom website development. PHP Vs Node.js, Which is Best? AngularJS is No More – Pros and Cons of TypeScript and Angular 2? Web Design & Development, Node.js, PHP, Frameworks – Latest News © 2016. All Rights Reserved.